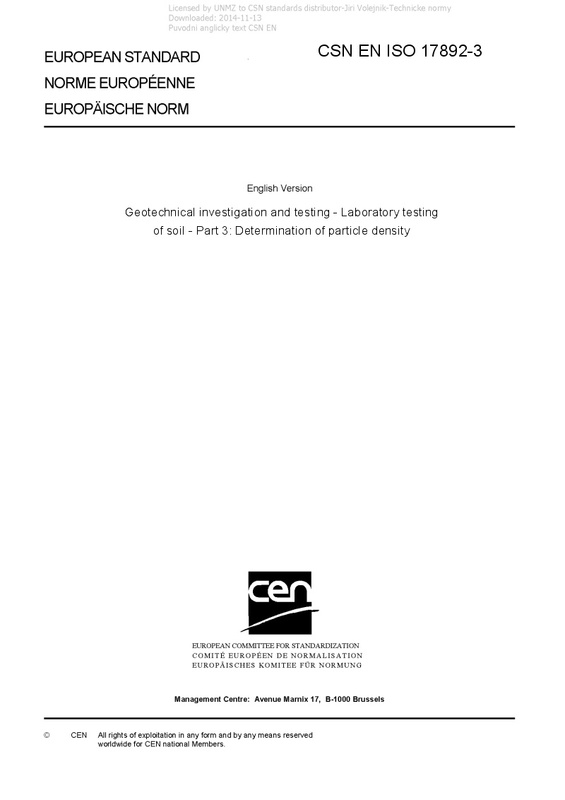 EN ISO 17892-3 Geotechnical investigation and testing - Laboratory testing of soil - Part 3: Determination of particle density - ISO 17892-3:2015 specifies methods for the determination of the particle density of soils. ISO 17892-3:2015 is applicable to the laboratory determination of the particle density of soil within the scope of geotechnical investigations, and describes two methods, a pycnometer method by fluid displacement and a pycnometer method by gas displacement. The fluid pycnometer method described in this part of ISO 17892 applies to soil types with particle sizes under about 4 mm, or soils crushed to meet this requirement. Larger pycnometers are used for coarser materials. The particle size of soils suitable for testing in the gas pycnometer is limited by the dimensions of the specimen container of the particular gas pycnometer being used. NOTE 1 ISO 17892-3:2015 fulfils the requirements of the determination of particle density of soils for geotechnical investigation and testing in accordance with EN 1997-1 and EN 1997-2. NOTE 2 The presence of dissolved salts in the pore water can affect the results of these tests. Techniques for compensating for dissolved salts are available but are beyond the scope of this standard.